You might remember that CSN stores recently offered me the chance to review a cookware item. Or you might not. In any case, I am a lucky girl, and it happened. I’m still pinching myself, because this Le Creuset 2-Quart Tatin Dish is the BOMB. Do people even still say that anymore? I feel like it was huge in college (yo, she’s da bomb! ), but now I’m an old person and I need to check in and see if these things still work. 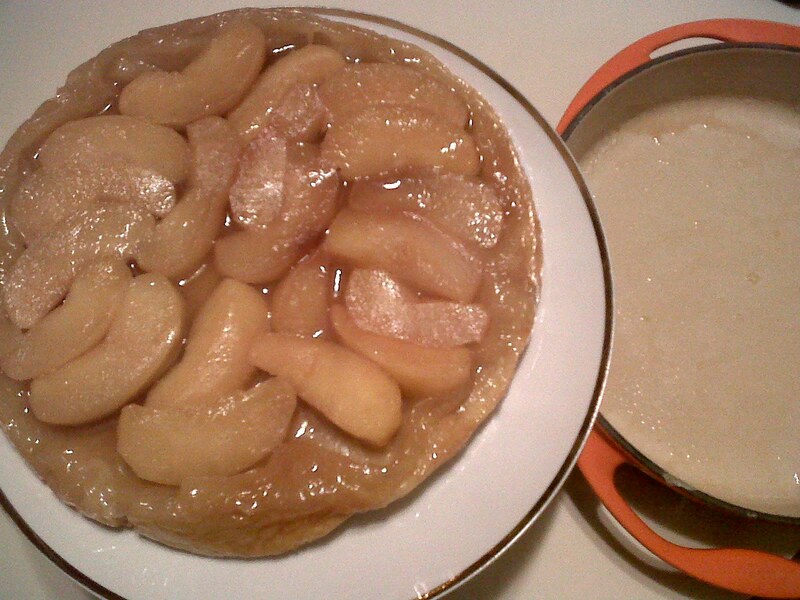 So, the tatin dish. 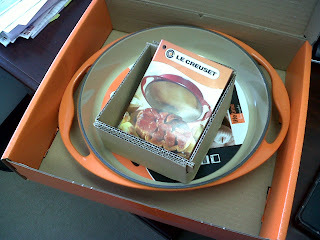 I already knew that Le Creuset was an awesome brand. They make bakeware out of cast iron overlaid with vitreous enamel, so it holds heat well and distributes it evenly. Food is also less likely to stick to the enamel surface, so it makes baking super-easy. And you can use it both on the stovetop and in the oven. Perfect for fruit tarts! 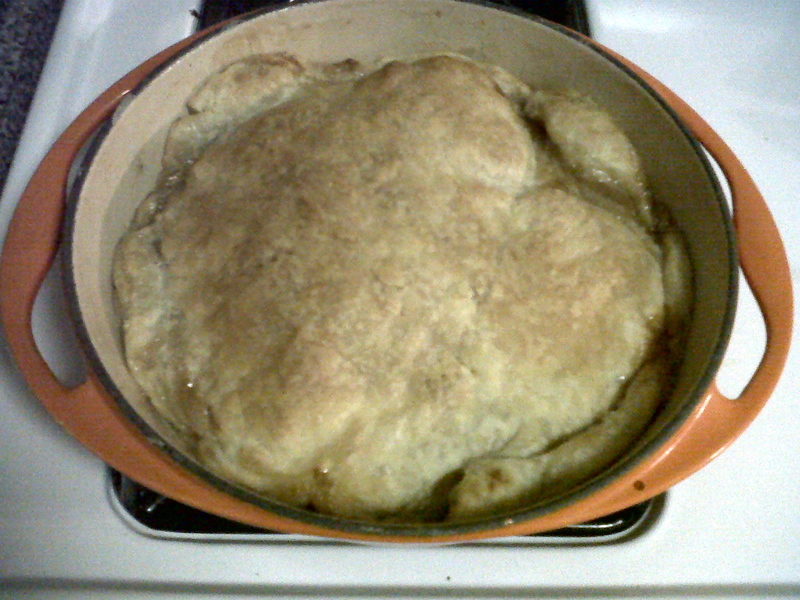 I made an apple tart to test it out, and it worked like a dream (no scorched butter - practically miraculous!). Plus, it’s bright orange and the handles are both stylish and more comfortable than I expected. Lesson: Don't underestimate the flare factor. I also roasted my orange-glazed salmon in it tonight, and the dish stood up to the test as a casserole & baking pan. I expect to use this item for a lifetime (and thankfully it comes with a lifetime warranty!). The CSN shopping experience itself was hassle-free. I ordered the dish and it arrived two days later in perfect condition. Thank you, CSN! Now, back to that apple tart. The dish came with a small recipe book that included instructions for fruit tarts, chocolate desserts with ganache sauce, quiches and more. I decided to start simple with an apple tart. Behold, the recipe! Remove the puff pastry from its wrapping and allow to thaw. Preheat the oven to 400˚ F (200˚ C). Put the sugar and butter in the tatin dish. Heat on medium on the stovetop until the butter is melted. Peel, quarter and core the apples. Place in the dish rounded side down to fill the base. Sprinkle with the lemon juice. Cook over a medium heat for 5 minutes. Remove from the heat and cool for a few minutes whilst rolling out the pastry. 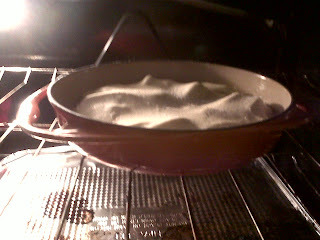 To start, unfold the pastry onto a lightly floured surface. Roll the pastry to a circle the same size as the top of the tatin dish. Press it lightly over the fruit, tucking the edges down around the sides so that when cooked it forms a rim to contain the fruit. Make four small steam holes, and transfer to the pre-heated oven. Bake on the top shelf for 15-20 minutes until the pastry is well-risen and golden brown. Let rest for 5 minutes before loosening around the edge with a knife. Invert onto a wide shallow plate. Serve warm with whipped cream. Serves 6-8. Notes: Plums, peaches or apricots may be used in place of apples – just cut in half and remove the pits. Apple brandy or cognac may also be used in place of lemon juice. Verdict: This was splendiferous. Way easier than it looks, and the result both tasted and smelled fantastic. Best served hot/warm, definitely. I’m officially in love with my dish. Maybe…a chocolate pear dessert with chocolate ganache sauce next time? I’ll let you know. YUM. omword... sounds and looks amazing. i can only imagine the smells. Yummy, and I bet plums would taste just as good. Oh wow! I'm feeling very jelly-belly right now! I long for Le Creuset bakeware! The tart looks fabulous. Taller than you'd expect, with loud laugh to match. Share book reviews and ratings with Cecelia, and even join a book club on Goodreads. where’s a sequel when you want one? tartlets. need i say more? second helpings of everything austen, please! i need your breadmaker (recipes). © Adventures of Cecelia Bedelia. All Rights Reserved.